I’ll try to give out more favas on another day so you can have more to play around with. One other slight difference from Monday’s share is you got rainbow swiss chard instead of just golden swiss chard. 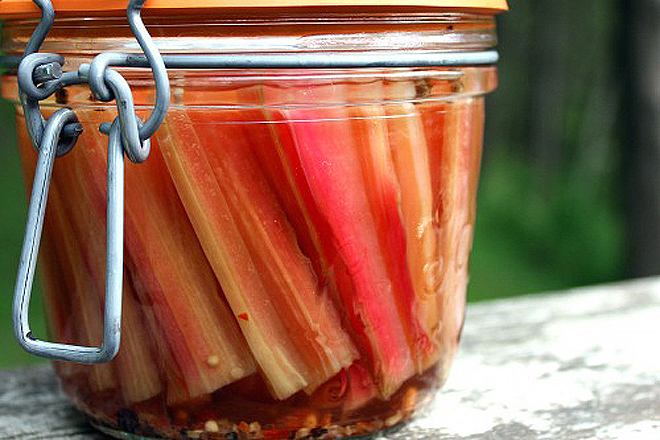 “this was the recipe I used for my quick chard stem and garlic scapes pickle. I like dill pickles 🙂 the picture attached looks like my chard stem pickles, but my pictures turned out poorly because of the light… but it will look this awesome in reality! In a large non-reactive pot, stir water and salt until dissolved. Add remaining ingredients and stir to combine. heat till just boiling. Pack vegetables in jars. Make sure each jar gets a garlic piece. Ladle hot brine over vegetables. Cover with a lid and refrigerate for at least a week before enjoying. You may re-use the brine to pickle a couple of times. Any brine you have left over can be refrigerated and reheated for another batch the following week! also, I would recommend blanching chard stems for a minute or two. I didn’t do it and I think it would improve the texture. it’s a little stringy. You could also slice the chard stems as you would celery to make them easier to bite into.